Six Flags from Quantico Y.C. This is the "house" pennant of Herbert Wood's fleet of inland holiday hire vessels based in the village of Potter Heigham in Norfolk, UK. 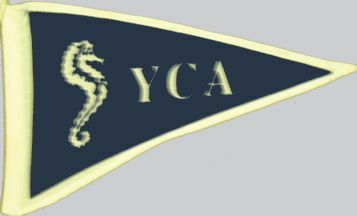 It is now located on it's proper page as the Club Burgee of the Lady Yacht Club. This is flag and information has been moved to its permanent location here. Many burgees in the Quantico Yacht Club were lost, destroyed, soiled or damaged when Hurricane Isabel hit the QYC. We have some that we cannot identify. Any help welcome. No. 4 is not the Royal Geelong Yacht Club. Any help in identifying would be welcome. Can you identify this shipping pennant seen on china? This pennant, white over blue with a red D, is the burgee of the Detroit Boat Club, the oldest rowing club in the United States, founded 1839. I cannot help identify the two large flags flown at the top of the hoist, which I assume are the ones in question, but can say that they are not the house flags of the two ships involved. By their size, and the fact that they are at the top of the hoist with smaller Japanese flags flying underneath, I question whether they might not be more likely to be American flags, possibly connected with the "Wahoo" itself. Was there a procedure for flying flags to represent sinkings when the submarine returned to port? According to the Dictionary of American Naval Fighting Ships, USS Wahoo (SS 38) was stricken from the Navy List on 6 Dec 1943, having been (as was later discovered) sunk with all hands on 11 Oct 1943. The second USS Wahoo wasn't commissioned until 1952. Either this photo was not taken on 6 Apr 1945 or is not of USS Wahoo. Wahoo did enter port at Midway on 6 Apr "1943," but following her fourth war patrol, not her fifth. The photo might have been taken then. Now, as to the flags: wasn't there an early form of RAF rank or appointment flag that had the RAF roundel superimposed on horizontal stripes indicating rank? The shades of black and white in the photo would be consistent with a light blue flag with blue-white-blue horizontal stripes and an RAF roundel superimposed on the center. If so, might whichever submarine this is have been carrying an RAF officer or celebrating a rescue of one (or two)? That's the only theory I can come up with. Just for general information, there is a website on the USS Wahoo at http://www.usswahoo.org/Tyskaorden2 that might help a little. We need a speculative image here. The front room of my flat opens onto the Great North Road, a major highway in the North of England, and I often sit and watch the different forms of road transport which pass by and stop at the traffic signal about twenty meters from my window. About ten minutes ago I saw a large HGV [semi-trailer] bearing a flag on its side which I have never seen before. The tarpaulin was red, and the words HABICHT EUROPA were written along the sides in large white sans serif block lettering, while beneath this were the words SPEDITION - TRANSPORT in slightly smaller white block lettering. To the left of the word Habicht, as seen by the viewer, was a white flag attached to a black staff with a button top and with two black tasseled cords attached, while an identical flag was positioned to the right of the word EUROPA. Because of the flagstaff and cords I feel safe in describing these as flags and not simply as logos. The flags have a white field with red fimbriation around all four sides, and are canting in that they are charged with the image of a hawk (Habicht is the German word for hawk) with wings displayed. The hawk is black, with a golden beak and talons and with red dots for eyes, a curved red tongue extending from the beak, and with black tail feathers tipped with red; there is also a large golden sans serif block letter H on the bird's breast. The hawk is shown with its head facing to the left on the flag to the left of the word HABICHT, and facing to the right on the flag to the right of the word EUROPA. There was no country identification, not even a phone/fax number or an e-mail address, either along the sides of the trailer, the rear doors (which simply had HABICHT EUROPA inscribed on them), or on the cab. While out on an afternoon excursion to a nearby town, Lockport, I noticed an odd flag flying outside a fast food restaurant there, along with a Canadian flag on the next pole. I was completely baffled at first, but I realized a few minutes later that red-white-yellow-black are traditional First Nations colours, and are often seen in S. Manitoba (and probably other places) to denote businesses, etc. that are geared to Aboriginals. (An aboriginal friend of mine says that the colours mean "peace.") This could possibly denote that the owner of the restaurant is Aboriginal, but what the particular flag signifies exactly, I'm not sure. Does anyone have any insight? This flag is most likely some kind of private variation of the AIM flag. The American Indian Movement (AIM) is a leftist activist Native American organization. The American Indian Movement Flag, is similar except the colors are mixed and this flag has a green circle added. As to what this flag does signify, I don't have any idea, perhaps some environmental issue? I wonder if you can help with this crest? It would be really helpful to find out the location as it would help me to establish where a mystery World War two youth pennant was used. I'm assuming that this is a German crest but it may also be from one of the German Reich territories 1933-1945. The number 817 refers to the unit. So far I have excluded: whole Czech Republic, region Opole (Poland), Alsace, Lorraine, Belgium, Denmark, Holland, Westfalen, Hannover, Saarland, Pfalz and Hessen... My opinion is that it is actually the arms of the town (tulips) and the region (cross), which makes me think like Rheinland somewhere. But no existing arms as far as I can tell. One (slight) possibility considering the character is a saint (based on the halo around his head) is that the cross is a saint's one although the colour is impossible to determine. My first impression is somewhere in Franconia (roughly the northern half of Bavaria). The zigzag in the left coat of arms looks very much like the "Frankenrechen" (Franconian rake), which is the Franconian coat of arms and http://commons.wikimedia.org/wiki/Image:Frankenrechen.svg. Many locations in this region incorporate this symbol in their own coats of arms, so perhaps it might be there somewhere. 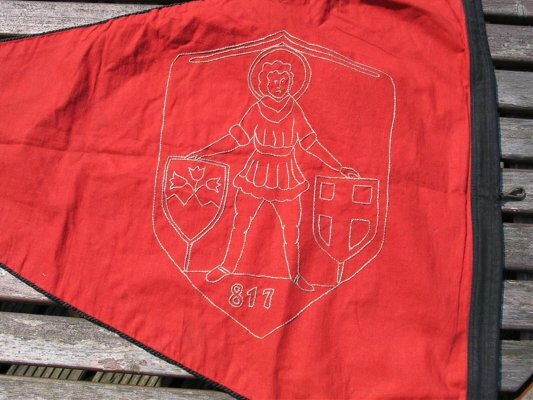 This is a red pennant with black scarf and the Coat-of-Arms of Geisa (I am sure) in yellow lining (saint holding two shields with "817" on central base point). Geisa is displayed in Ralf Hartemink's heraldry page. He also shows the old version of the arms, drafted by Otto Hupp. This is a flag of the Australia-South America Line. I have a small swallow tail flag color green appears to be cotton. Sewn on it at the top is a four digit number, below that are two crossed flintlock pistols and below that is "POW". I got this in a military items lot with no further information. Any information or insight from you would be appreciated. This appears to be a U.S. Military Police Prisoner of War company or platoon guidon. The MP branch colors are green and yellow, and the MP branch insignia is a brace of crossed flintlock pistols. See http://tmg110.tripod.com/usarmyg1.htm for some samples. The MP guidon shown on the page only shows a company number, but a specialty unit (such as POW guards) would have the specialty designation. This flag has been identified and has been moved to its correct page as the Royal Dutch Motorboat Club Ensign. The burgee is triangular (point to right), yellow border on black material, with rear view of sitting cat with striped tail. It is obviously at least 50 years old. If it helps, both my father (born 1917) and my grandfather were great sailors. My father was in the Merchant Navy through the war, first as a Cadet with BISN Co, then on the Atlantic Run. He was then with East African Railways and Harbours from pilot through to port manager. He belonged to Dar-es-Salaam. Mombasa, Mtwara & Tanga Yacht Clubs. His Father was in the British army 7 served in India (where he also sailed.) He then settled in UK and sailed on the Solent. Any ideas for this flag? I have several pieces of Homer Laughlin Best China U.S.A. with the marking on the back AAB-11. The Flag on the front of the china is a rectangular flag, with blue stripes across the top and bottom with a red dot and a sailfish in the middle of the dot. 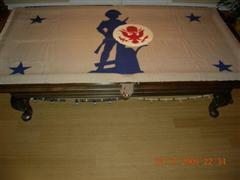 Could you please tell me what flag or who it was made for? My brother is on vacation in Halland in Sweden. There he saw a blue flag with three yellow, five-pointed stars, one above two. The flag was seen in the little village of Glommen in Falkenberg municipality. He wants to know what flag it is, but I don't know. I have searched the FOTW-ws but haven't found any flag like it. Does anyone have any idea? This has all the appearance of a NATO or EU Command Flag for a (perhaps now retired) three-star Vice Admiral or three-star Lieutenant General, possibly for a special military mission or command. It also could be some type of command Naval Jack (just the canton) of a Swedish Rear Admiral's flag, since the blue used in my speculative drawing is completely an arbitrary choice. But Swedish rank stars are white, not yellow. Also, from Wikipedia, it seems we can rule out Halland County and its municipalities where this flag was found. You are, as usual, quite correct. The gold color of the stars did have me leaning towards the EU, but I was just fishing. It was also why I was suggesting a command flag for a special military mission or command. This flag has been identified and has been moved to its correct page as the Binnenschiffahrtskontor Beck Ensign. To help the identification I send here a scanned copy of the badge, we were yesterday discussing about. They might be Finnish, but but... The one with the white star and green/red bottom and the other one with the J inside the yellow circle on white bottom.? The other two are identified to 90%. My wife is watching an old movie "The Wind and the Lion". There's a scene (according to her, set in Morocco), which had a green flag with three white crescents on it. My immediate thought was that it was a historical flag of Egypt, and they got the flag wrong, but some research tells me I was thinking of the Kingdom of Egypt Flag (1922-1952). I couldn't find anything resembling it on the Morocco pages (the closest I could find was from Sandžak, but that was in "Serbia-Montenegro", which indeed looks like it, at least the green part of the shield. Sean Connery plays Raisuli (a Moroccan rebel chief) - is it his flag? This film is based on the famous (apocryphal?) remark by then-president Teddy Roosevelt about Raisuli's kidnapping of one Pedicaris: "I want Pericaris alive or Raisuli dead." Also this "Reported Flag of Tripoli" with three crescents pointing to the center standing for Tripolitania. My first reaction to three crescents on green would also have been Egypt, not Morocco. It is true that US films have got historically more aware over the years, and indeed more careful in designing their props, however, perhaps we should remember that both the green field and the crescents could be considered "archetypal" of Islam, and that this may not, therefore, be a copy of any actual flag? Several years ago I sent gifs of sections of an old flag chart from the centre pages of Delisle's 1739 atlas. One of the flags on that was a green swallowtailed flag with three white crescents, arranged so the points were pointing in to a common centre. That flag was one of two or three designated "Grand Turks" presumably the one in Asia Minor, not the one in the Caribbean. On the same chart, the one for Tripolitania was similar, but rectangular and with yellow crescents. This would be Ottoman Empire to me. It's on Tableau des Pavillions de le nations que aborent à la mer 1756 as Pavillon e l'Empereur des Turcs, with the crescents in three orientations, but I've seen depictions with three in a row as well, though I can't recall the direction for that case. In the Winter 2003 issue of the "Flagmaster" (number 111) they feature the Barnes Flag Sheet, published in Philadelphia in 1837. 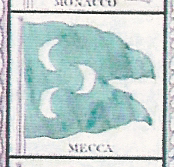 On pages 10-11 they reproduce the sheet and it shows a banner from Mecca that is green with three white crescents. Is this the one you are looking for? The flag description matches that of the pennant of the Sultan of Sandzak (translated from Turkish). Your wife may have confused "Montenegro" with "Morocco." There's no confusion; the story is set in Morocco. Whether the flag is authentic or just the filmmaker's license is another issue. Montenegro has nothing to do with it. There's no desert in Montenegro, nor was Raisuli Montenegrin. Now that our attention is drawn to Sandzak Montenegro, I notice that while we show their flag as including the three crescents on green, we don't seem to have an explanation for that. Does anyone know more about this? I hope Davide will share with us the source he is translating from. For one thing, I'm curious whether there's more flag information in it. But for another, as, as I understand it, "sandzak" actually means "standard," I wonder whether the Turkish might mean "Standard of the Sultan" instead. Possibly the context might tell us more. As far as I know there was never a "Sultan of Sandzak [of Novi Pazar]" - the highest official would have been "Pasha." I think I found it! The flag might be that of Tripolitania, a former region of Libya. Here is the link for the flag , and here is the link to Tripolitania. Even if that Flag of Tripolitania had firmer documentation, it is only "a reported flag" on FOTW. I would hesitate to say more than that UFE shown in the movie was similar or identical in appearance to that flag of Tripolitania. Saying that it "was" or even "might be" the flag of Tripolitania implies that was what the filmmakers intended it to be. Unless someone can present evidence that they actually did intend that, or present a likely hypothesis as to why they might intend it, I believe it would be too large a leap to equate the two flags. Although the flag is never mentioned in the The Wind and the Lion movie, the shots it are usually shots of Raisuli and his people. Either he is in the scene, often with the flag flown by the rider next to him, or it flies over their location. The one exception is when it is flown during an attack to free Raisuli. Does that make it a flag for Raisuli, his followers, his family? I don't know, but it's certainly a flag of status in the film, more than a flag that just happens to be present in one scene. However, the discussion about this UFE wandered off to flags with crescents in different directions. That's not what the flag in "The Wind and the Lion" looks like. That one would probably be: Green, three crescents open towards the fly, placed two before one. It's not exact, but this is what I can do without watching the entire film again to find the best shot. The flag is one of several flags making an appearance in the film, with other tribes(?) bringing other flags, but the film is quite correct in how real flags are treated: They receive a lot of respect, which allows them to go everywhere, but they receive very little attention, thus they aren't usually in the focus of the camera. Maybe the original reporter is able to add more about this. Eh? Although the discussion was derailed by some wild speculation ranging geographically far from relevance, I see nothing coming forward yet that moves this out of the realm of fiction. The film "The Wind and the Lion" was loosely - very loosely - based on the Perdicaris Affair of 1904 in Morocco. Here are some toy soldiers inspired by the film, including Berbers carrying a flag. Here is an image from the film showing several flags, including one that closely matches the toy version (six crescents). 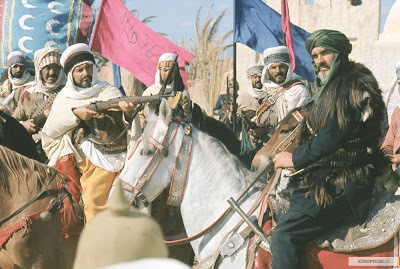 Several books have been written about the Moroccan Crisis and the Berber chieftain Raisuli. If anybody has the time and inclination, we might be able to establish from photographic what flags, if any, Raisuli's Berber clansmen carried. In the meantime, the flags in the movie remain "flags in fiction" for lack of further documentation. It appears one of the toy soldiers is also carrying the flag that we're after. I wonder whether there's an individual description for each distinct figure? Before the Aza flag, have you ever seen a Berber using a flag? I expect the flags were made up for the film, with no flags being used at the time portrayed. This flag has been identified as that of the Sportverein Rot-Gelb Harburg von 1950 e.V. and is now located in its proper place in the FOTW database. I saw this flag a few days ago during a walk in the village of Haut-Vully in the Canton of Fribourg in Switzerland. I was unable to identify it and no one in the village could help me. The best match I can find is: Azure a Cross pattee couped Argent - Neuendorf in Solothurn. The design of the Swiss National Flag in the colours of the flag of the Sarine district from that Canton? I'm sure you would be interested, I am adopting this flag [ufe08-19] as symbol of AeroSwiss. This company assigns high status aircraft registrations for the corporate jet market. As, with these tail numbers (e.g. G-IVSP for a Gulfstream IVSP or N737BJ for a Boeing Business Jet), also comes an accompanying 'airway' and on ramp prestige. The tail of these aircraft will carry the blue Swiss flag as identification. I hope this sounds ok to you as it was thru you I came across it several years ago. I have been using it for several years for browsers as and now in earnest with aero-swiss.ch (under construction). That's interesting. G and N stands for British and US aircraft respectively, so you are not registering the planes in Switzerland? Yes, and all flight call signs (of the aircraft with AeroSwiss regs) will start with "blueswiss...4548" (4548 being the transponder code) then at the departing hand off, eg. "G-IVSP...have a good one" and away.....wow, one of the only six, industry flagship aircraft/reg has just passed thru their airspace. Fabulous. An unknown Indian flag. Description: It is a Indian tiranga (tricolour) using the colours saffron, white and green. Saffron is a little bit darker than the first colour of the current national flag. At the hoist is a blue rectangle taking total height of flag. It's width is nearly 50% of total width. In its centre is a white Ashoka wheel. Context: A female supporter upholds a poster, demonstrating against Condoleeza Rice. The image of flag is upon the upper left corner of the poster. The blue headline beside the flag it would be in Sanskrit: "bhaaripa bahujana mahaasamgha;" in Hindi probably "bhaarip bahujan mahaasangh", which could be: "massive group of people (added: causes/means) big destruction." So this is not the name of a Party, at least I wouldn't name a party like this, nevertheless I believe, it is an unknown party flag. As the rally took place in Mumbai, the inscription could of course also be in Marathi. Note that I have transcribed but not correctly transliterated in order to avoid diacritics. Long vowels I've simply doubled. Source: Sunday Times of Malta; 5 October 2008. 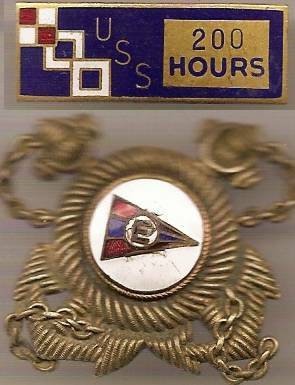 The top badge showing three signal flags and the initials USS is that of the World War II United Seaman´s Service, whose duties are described as "serves war-battered merchant seamen on the six continents." The 200 hours reflects the volunteers service in the merchant marine, in a combat zone I believe. 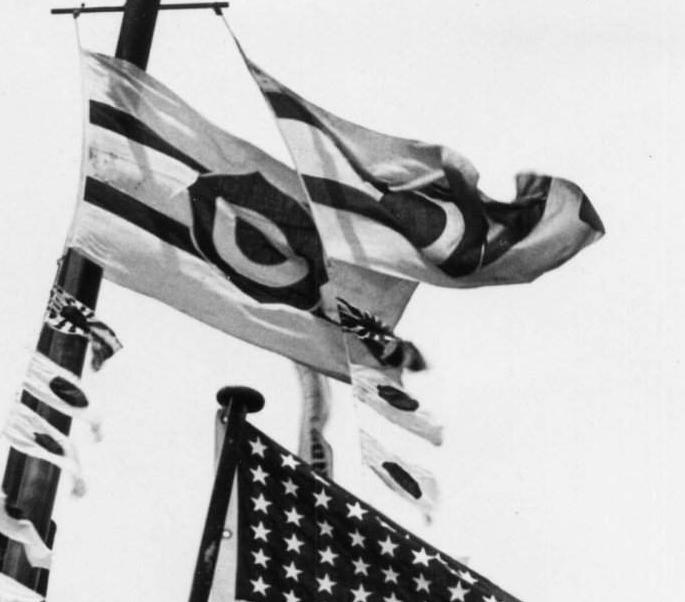 This emblem of the three signal flags is seen on a poster promoting the National War Fund which is illustrated in NAVA NEWS 189. If anyone wants pdfs of these issues of NAVA NEWS, the issues I edited are located at http://www.vexman.net/nnpdf/ and you can find the ones referenced there by issue number. Here is the GIF of the pennant for the Army-Navy "E" Award, as awarded by the US Government to factories for excellence in the production of military equipment from 1942 to 1945. See Army Navy E Award in Wikipedia for more details. Contradictions: The material of the flag was vinyl or nylon. So it had been manufactured recently. The coat of arms seems to me a strange mixture of Hospitalier's and Russian heraldry. The Maltese crosses and the inescutcheon are typical for the Order of St. John. Double headed eagle, crowned and the blue ribbon seem to be Russian. Russian Emperor Pawel I once occupied the title of the grandmaster but his son ceded this title after Pawel's death to an Italian. So the flag may be a reprint of Pawel's grandmaster flag. All that stuff may also simply be a mocking flag, unless there were two doorplates varying the pattern shown upon the flag and two other plates, showing arms of knights (I guess each knight had his personal arms), that seemed to me somehow Aragonese. The location was in Qawra at the waterfront in a small house between big hotels. Except for Qawra tower, today a pizzeria, there is not a single historical building in Qawra (part of St.Pauls). To complete the chaos there was of course nobody there, I could have asked. A question in the Facegroup reminded me: Some time after the report of a Order of St. John unknown flag, I contacted the SMOM. In their opinion, the flag was of one of the copies, not of the original order. I received this inquiry and was wondering if anyone on list had heard of this thing. Question: The flag is 15.5 in. wide and 11.0 in. high; equally divided into red (left) white (center) blue (right). In the bottom left corner are the letters "C.I.G." and in the upper right corner "C.E.F. ", both set at an angle. The flag has gold fringe trim. I was told he brought it home from WW II, from France. No other info and he is long deceased. - Not quite 2:3, but could that be due to not measuring the sleeve? - Why does it have the colours the wrong way round, if French? - Could text at an angle be because it was hung as a banner of sorts? - Why is it so small? Maybe 42x28cm. - Military or similar? Instrument banner? - Do C.I.G or C.E.F. mean anything in France? I asked him if he was sure about which color was at the hoist, and he replied that it was indeed the red. I doubt a mere signal flag would have a gold fringe. I'm stumped. Might it be commercial rather than military? If it is French, it just might be the fanion of the Centre d'Instruction du Génie du Corps Expéditionnaire Français, i.e. - a training centre for engineering troops who were part of the French contingent serving in Italy and southern France 1943-45. French unit fanions are 30cm x 40cm, plus a fringe, so that's pretty close to the OP's description. The fanions of Engineer units and sub-units (regiment, battalion, company) are normally red and black, but a tricolour might have been used for one that came directly under CEF command. But I can't explain the arrangement of the red, white and blue. Let me take the opportunity to make a guesswork flag with a 3:4 ratio.